This is what my teen wants for their birthday. A "real" camera and wants to get into photography. 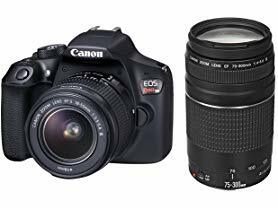 Today ONLY - Canon EOS Rebel T6 DSLR Camera with EF-S 18-55mm IS and EF 75-300mm III Lens Kit $399.99. -18.0 Megapixel CMOS (APS-C) image sensor and high-performance DIGIC 4+ Image Processor for excellent speed and quality. -ISO 100–6400 (expandable to H: 12800) for shooting from bright light to low light. -Built-in Wi-Fi* and NFC** connectivity provide easy sharing to compatible smart devices, select social media sites and the Canon Connect Station CS100 device. -9-point AF system (including one center cross-type AF point) and AI Servo AF provide impressive autofocus performance with accurate results. -High-performance Optical Viewfinder helps facilitate quick and accurate focusing by firmly framing and capturing the subject at hand. -Large, 3.0-inch LCD monitor with 920,000 dots shows fine details and provides easy viewing. -Scene Intelligent Auto mode simplifies settings for users without extensive photography experience. -Feature Guide offers short descriptions of shooting modes, settings and effects for easy operation. -EOS Full HD Movie mode for easy-to-use video capture.